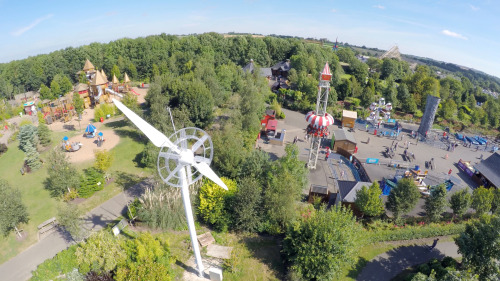 Airsynergy’s patented wind turbines at Tayto Park (image courtesy of Airsynergy). Wind power has experienced a significant increase, rising by more than 26%, and Airsynergy believes many areas still remain unexplored when it comes to wind power (image courtesy of Airsynergy). Jim Smyth, CEO at Airsynergy, comments on the necessity to generate renewable energy in the 21st century, and how revolutionary wind turbine technology can change power production for the better. The UK has experienced strong progress with regards to their renewable credentials. According to a report by the Department for Energy and Climate Change (DECC), low carbon generation has increased from 37 per cent to over 45 per cent from 2014 to 20151. This is due to an increase in nuclear and renewable energy generation. While many coal plants have succumbed to closures and conversions, decreasing its energy generation by 7 per cent, renewable energy sources such as wind, solar farms, hydroelectric dams and biomass accounted for 25 per cent of the UK’s electricity generation in 20152. Wind power has demonstrated a particularly significant increase, rising by over 26 per cent. This investment in renewable technologies such as wind power only looks set to increase further over the next year, following the former Chancellor George Osborne’s allocation of £730 million towards auctions to back renewable energy projects and their consequent infrastructure in his 2016 Budget3. Wind energy generation, whether that be onshore or offshore is incredibly crucial, not only in lowering carbon emissions, but also in easing the dependency on coal and gas for energy. According to a 2014 report commissioned by RenewableUK, coal imports were reduced by an estimated 4.9 million tonnes in 2014, and gas by 1.4 million cubic metres4. Not only does wind power provide the obvious environmental benefits, but wind energy is also contributing to reducing fossil fuel import dependence, and this contribution will increase as wind power’s dominance continues to grow. This increasing investment in wind power acts as an insurance policy against unstable gas and electricity prices. Small-scale wind turbine installation is a no-fuss process – simply because most commonly they are grid-tied which means that the set-up is minimal. To install a grid-tied wind turbine, a cable must be fitted in the fuse box within a building which links to the wind turbine, which is in turn connected to a grid-tied inverter. This way, if there is any break in power generation, the load can be effectively balanced. The energy produced from the turbine goes straight to the customer’s premises, with any excess power automatically exported to the grid. Installation is also effortless with newer, small-scale turbines, as the laying down of the turbine’s foundation is simple and installation and commissioning takes just two days. Wind power must be appropriately utilised in the UK. A solution was required in the renewable energy sector. Two-in-one wind turbines utilising revolutionary technology have been created to ensure that maximum performance is guaranteed. These newer wind turbines, using patented technology, not only contain a standard rotor and blades, but also contain a multi-bladed duct augmenter. This augmenter concentrates and amplifies air from the inside out, increasing the speed of the wind flowing past the two-bladed rotor system. This means that the system is able to cut in at significantly lower wind speeds when compared to conventional wind turbines. Typically, the chief objection against standard onshore wind turbines in the UK is that wind speeds can’t be relied upon to provide regular, reliable energy – something which is particularly crucial in an increasingly globalised and energy-focussed world. Typical wind speeds in the UK are not strong enough to make the blades of a standard turbine move. However, turbines which utilise this revolutionary technology can generate energy in almost every location imaginable - making it an incredibly versatile and powerful energy generator. Many areas remain unexplored when it comes to wind power. Less than 20 per cent of global wind sites are economically viable and provide adequate power when standard wind turbines are used. However, for turbines using the latest technology consisting of a multi-bladed augmenter, ca. 80 per cent of global wind sites can be utilised. This means that these turbines can be placed in locations that would ordinarily have been deemed unsuitable. From farms, to streets, to theme parks – all can install these ground-breaking wind turbines and receive a quicker return on investment. Due to their ability to magnify wind speeds, these revolutionary wind turbines can increase power production performance by ca. 100 per cent compared to similar kilowatt capacity turbines which do not contain this technology. This increase in power output not only makes turbines more affordable when compared to the grid price, but it also makes them the most affordable renewable energy solution available. The performance of turbines utilising this revolutionary technology is quite outstanding considering that they are often as small as a two storey house in height. They are therefore not visually obtrusive for those living or working nearby. Energy consumption figures have demonstrated a 1.9 per cent rise from 2014-20155, and this growing demand must be met. Investing in forward-thinking, renewable technologies such as these revolutionary, patented wind turbines will ease the demand for energy, reduce the reliance on carbon-heavy energy sources, and be cost-saving; whilst also ensuring that our planet remains intact. Tayto Park is Ireland’s first theme park, and contains enough thrills and spills to keep adults and children alike entertained. Situated twenty miles west of Dublin, it is a theme park which name originates from Ireland’s famous Tayto crisps. Visitor numbers have steadily increased for Tayto Park since its opening in 2011, with yearly visitor numbers topping 800,000. Providing power for Tayto Park is a large-scale operation, and one which required a rethink if cost-effectiveness and sustainability were to be prioritised. 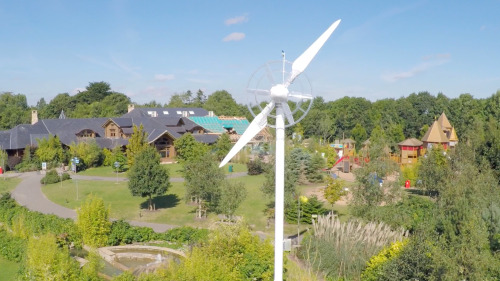 Utilising renewable power was an obvious solution, and Airsynergy’s Total Energy Solution (TES) was chosen to provide power to Tayto Park via a ground-breaking wind turbine. The TES wind turbine provides the highest power output on the market, and can equate to cost-savings of over €6,000 per year. Cost-savings are incredibly important to any business, as is sustainability and its overall aesthetics.